There has been a rare fossil find in outback Queensland, Australia. In July 2014, the Wilson family from the state of Victoria went as tourists ‘to search the local free fossil hunting sites’ around Richmond, Queensland. It’s a long way to go for a holiday. Seven-year-old, Amber Wilson, found a fossil of ichthyosaur Platypterygius australis. Found what? It’s an extinct dolphin-like marine reptile and the fossil has a one metre long skull with teeth that are six metres long. ‘I have never seen tourists uncover such a beautifully preserved fossil before’. ‘It is easily the most complete ichthyosaur skull in our collection and one of the best from Australia’. ‘I was completely stunned. A professional palaeontologist might search their entire career to find a fossil of this quality. It only took the Wilson family a few hours’. 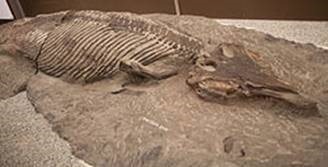 The fossil has been temporarily called ‘Wilson’ after the people who found it. How could a dolphin-like marine animal fossil be found 500 kilometres inland from the ocean (that’s the distance from Townsville – on the ocean – to Richmond). The Flinders Highway starts at Townsville on the Pacific Ocean coast. Here are the distances from Townsville. ‘Platypterygius lived 100 million years ago during the Cretaceous Period; at a time when dinosaurs still ruled on land’. ‘Kronosaurus Korner is Australia’s premier marine fossil museum, showcasing more than 1000 fossils of creatures that once inhabited Australia’s ancient inland sea’. These kinds of statements tell us something about the reasons behind some of the following statements. There is a worldview that is being displayed and promoted. The explanation from a scientific palaeontological perspective is that these fossils were from a time when Australia had an inland sea in ancient times. Why do scientists think this big sea animal existed? Layers of rock from the Cretaceous Period in the Great Artesian Basin contain many fossils of marine (sea) dwelling animals, proving the area was once covered by the sea. These animals included some very large reptiles such as the plesiosaurs, ichthyosaurs, and crocodiles. You may like to investigate these animal groups (Accessed 20 November 2014). The explanation for this extraordinary fossil find of an extinct, dolphin-like marine reptile 500 km from the ocean is that it once swam through Australia’s ancient inland sea. That may have been the case but how are we to know that piece of information? From some evolutionary text book that feeds us with that kind of worldview? But there is a missing factor that palaeontologists don’t like or don’t want to discuss. ‘The waters completely inundated the earth so that even all the high mountains under the entire sky were covered’ (Genesis 7:19 NET). A global flood is what happened to the earth in the time of Noah. Read about it in Genesis chapters 6-9 (NET Bible). This world-wide flood would have left lots of fossil evidence all over the world, in the outback and on mountains. To me, that reads like a more reasonable explanation of the origin of this dolphin-like animal fossil in the western Qld fossil find. This flood would have left a humungous amount of dead animals and people who would turn into fossils over time. It is expected that evolutionary scientists who have been educated in and have imbibed a secular worldview will not want to understand or consider the impact of a global flood on the palaeontological remains of a marine creature in Australia’s outback. ‘ For just like the days of Noah were, so the coming of the Son of Man will be. 38 For in those days before the flood, people were eating and drinking, marrying and giving in marriage, until the day Noah entered the ark. 39 And they knew nothing until the flood came and took them all away. It will be the same at the coming of the Son of Man’ (NET Bible). See also Luke 17:26-27 (NET). Here is where the information from Lita Cosner’s article (link above) is especially helpful. Jesus believed in Noah and the flood. Why don’t you take a read of her insightful article? 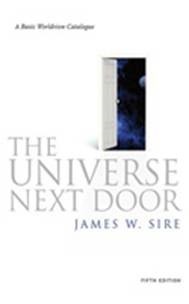 For some penetrating analyses of divergent world views, see James W. Sire 2010, The universe next door (IVP). This is James Sire’s definition of a world view: ‘A world view is a set of presuppositions (assumptions which may be true, partially true or entirely false) which we hold (consciously or subconsciously, consistently or inconsistently) about the basic make-up of our world’ (Sire 1988:17). Sire, J W 1988. The universe next door: A basic world view catalog, updated & expanded ed. Downers Grove, Illinois: InterVarsity Press. Sire, J W 2010. The universe next door: A basic worldview catalog, 5th ed. Nottingham, England: Inter-Varsity Press. These details have been obtained from the Brisbane Times article, ‘Seven-year-old girl’s rare fossil find in outback Queensland’, available at: http://www.brisbanetimes.com.au/queensland/sevenyearold-girls-rare-fossil-find-in-outback-queensland-20141119-11pgpm.html#comments (accessed 20 November 2014). Copyright © 2014 Spencer D. Gear. This document last updated at Date: 21 November 2015. This entry was posted in Evolution, Palaeontology, The Flood (Noah) on 20 November 2014 by spencer. Did Genesis 6:3 get it wrong? This verse reads, ‘Then the LORD said, “My Spirit shall not abide in man for ever, for he is flesh: his days shall be 120 years”’ (Gen 6:3 ESV). I was reading my bible earlier and finally finished Genesis. Anyways there were a few bits in there that caught my eye; it`s to do with Jacob’s, and Joseph’s lifespan, and well I remember in the first few chapters of Genesis god said he would make man mortal and … found the quote: ‘Then the Lord said, “My Spirit will not put up with humans for such a long time, for they are only mortal flesh. In the future, their normal lifespan will be no more than 120 years”’ (Gen 6:3 NLT). And so then I found this quote: ‘Jacob replied, “I have traveled this earth for 130 hard years. But my life has been short compared to the lives of my ancestors”’ (Genesis 47:9 NLT). And there`s, ‘Jehoiada lived to a very old age, finally dying at 130’ (2 Chron 24:15 NLT). Also: ‘Job lived 140 years after that, living to see four generations of his children and grandchildren (Job 42:16 NLT). There are probably more but I can`t be asked to look. Can a Christian please explain, why god said people won`t live more than 120 years, yet they’ve lived for 130+ years. This to me makes the bible sound like one big story, I`m hoping someone can change my mind. Please also can you quote from the bible or just say the passage that`s relevant. These were reasonable objections from Jahleel. On the surface, it does look like the Bible is contradicting itself. And Yahweh said: My spirit shall not judge among mankind forever, because they also are flesh. Yet shall their days be one hundred and twenty years (1942:254). Entirely in harmony with our rendering is the concluding statement of the verse, which marks the setting of the time limit of divine grace. For these words, “yet shall their days be one hundred and twenty years,” are to be taken in the sense of the traditional interpretation: one last period of grace is fixed by God for the repentance of mankind. The previous word indicated (3a) that God might well have cut off all further opportunities of grace. This word (3b) shows that grace always does more than could be expected. Before disposing of the guilty ones a time of grace of no less than one hundred and twenty years is allowed for their repentance. This use of “days” (v3) is established by the use of the same word (v4) “those days.” Consequently, the modern interpretation that takes this word to mean that God here decreed that in the future the span of man’s life was not to exceed one hundred twenty years is quite unfounded. This view is proved untenable by the fact that quite a few after the Flood lived in excess of this limit: 11:11, 13, 15, 17, 19, 21, 23, 25; 25:7; 35:28; 47:9. The evasions of the critics in meeting this argument need not be mentioned, being too palpable (Leupold 1942:256-257). “Therefore his days shall be 120 years:” this means, not that human life should in future never attain a greater age than 120 years, but that a respite of 120 years should still be granted to the human race. This sentence, as we may gather from the context, was made known to Noah in his 480th year, to be published by him as “preacher of righteousness” (2 Pet. ii.5) to the degenerate race. We know from the following context of Genesis 6:5-8 that God is preparing for the judgment of the Flood. So the 120 years has nothing to do with the longevity of a person’s life after that time, but the time given to the people until the judgment by destruction in Noah’s Flood will come. If such knowledge is not available to a Bible reader (which is the case for me), a sound commentary, based on the Hebrew, is needed. What do I mean by ‘sound’? I am referring to commentaries that accept and promote biblical authority and are not written by theological liberals who want to denigrate or destroy the Bible. A sound commentary, based on the Hebrew language, helped me to overcome these difficulties. Keil, C F & Delitzsch, F n d. Commentary on the Old Testament: The Pentateuch, vol 1. Grand Rapids, Michigan: William B. Eerdmans Publishing Company. Leupold H C 1942. Exposition of Genesis. 1942. The Wartburg Press, also London: Evangelical Press. Also available online at CCEL at: http://www.ccel.org/ccel/leupold/genesis.i.html (Accessed 19 October 2012). Or My Spirit shall not contend with. Christian Forums, Christian Scriptures, ‘Can a Christian please explain this?’ Jahleel #1. Available at: http://www.christianforums.com/t7695361/#post61587089 (Accessed 19 October 2012). Some grammatical and spelling corrections have been made to this quote. Copyright © 2013 Spencer D. Gear. This document last updated at Date: 2 September 2015. This entry was posted in Genesis, The Flood (Noah) on 19 October 2012 by spencer.